So The Writers of the Apocalypse signed on a new author, Christian Madsen, and that’s where I’ve largely been lately. It’s been a lot of hard work – talk about one intensive book! – but finally we’re good to go. And I’d like to start off with the most fun thing: a cover poll! Yeah I know, everybody’s doing it. 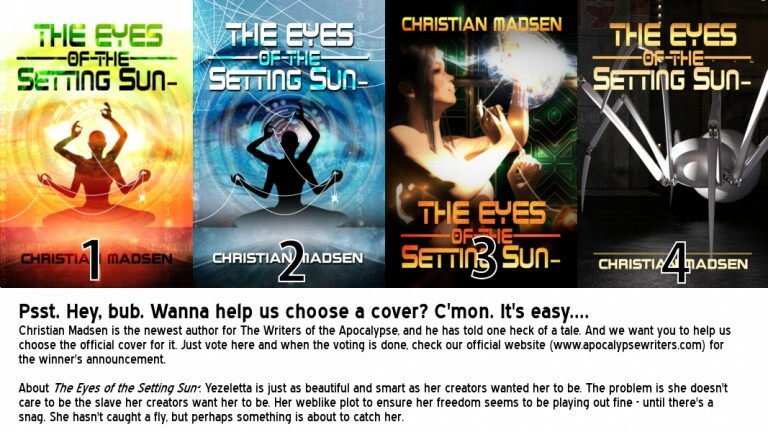 But isn’t it fun to help decide what cover is the best for a book? So let’s help Christian Madsen start off his writing adventure with the best dress to offer. Just click the image below to get to the poll or check the embedding below, and let me know what you think! Take away one pair of arms and I will vote for #1.